This Francis' Famous recipe can be used for pies or tarts. I just happen to make tarts because we were serving so many people we thought it would be easier. So this recipe goes way back to about 1990, so that may not sound too far back for some of our readers but I was ten and about this time I started being tasked with making the pumpkin pies for holiday events. over the years I tinkered with the base recipe i was given until about 2001 I stumbled upon the base for this recipe. After that I spent about 5 years refining it into what I would like to think is one of the finest pumpkin pie recipes out there. While this pumpkin pie crust and filling is tailor made to please my taste-buds I have received so many complements I figure it just must be the right balance for most anyone! 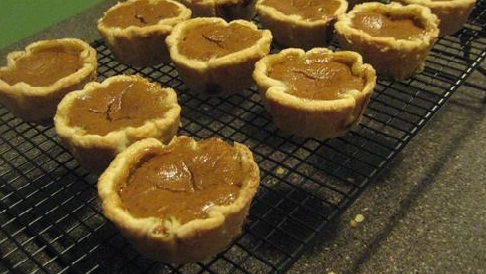 I do hope you enjoy my Punkin' pie tarts or pumpkin pie because it was a labor of love for 15 years of my life! 2-3 tsp brandy for brushing right before pre-backing 1 tsp after pre-baking. Mix all dry ingredients in a food processor until even. Add butter and pulse for 7-12 seconds. Pour mixture into a medium sized bowl and drizzle water over mixture as you roll and fold dough into a ball. Wrap dough in plastic wrap and refrigerate for 30-45 minutes. Remove dough and roll into enough little balls of dough to make crusts for three tart pans. Roll each small ball of dough out with rolling pin and press one into each separate tart pan impression, Trim back all but 1/2 inch of dough from the crusts and fold under this over hanging dough to create a lip. Gently press a fork around the folded dough lip. Repeat until all tart pans are full. Place tart pans uncovered into refrigerator and chill for 20 minutes. Remove from refrigerator and poke holes sparingly around all tart crusts, press an aluminum foil sheet over and into each tart pan crust. Prick a few holes in aluminum foil so that it can breath and settle, return to refrigerator and let chill for 1 hour. Once heated place tart pans on the lowest rack and bake for 15 minutes (while they are cooking it is a great time to start your filling.) After 15 minutes press down foil to make sure there are no bubbles in crust then remove foil and lightly brush with brandy, bake another 7 minutes or until inside of crusts begins to brown. Remove tart crusts from oven and move to a wire rack. Pulse pumpkin, sugar, syrup, ginger, cinnamon, nutmeg, cloves and salt in food processor for about 1 minute. Pour the mixture into a deep sauce pan and bring to a simmer over medium high heat. Stir constantly and cook until think and shiny (about 5 minutes, about this time you should be taking your crusts out of the oven.) Whisk in milk, cream, vanilla and syrup into the mixture and then remove from heat. In a medium bowl whisk together eggs until smooth and then pour into pumpkin mixture whisking until mixed well. Once more brush crusts lightly with brandy and then fill each crust with pumpkin filling. Place tart pans back into oven and bake for 25 minutes or until pie is gelatin like. Remove tart pans from oven and let cool for 1 hour on wire rack. Serve warm or chilled, plain or with whipped topping and enjoy!